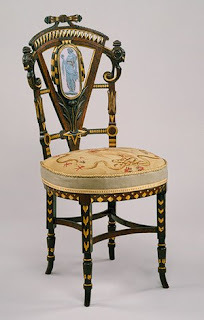 This Egyptian chair combines Neoclassical and Egyptian Furniture of decorative motifs with a form reminiscent of the bentwood café chairs popularized in the 1860s by the Viennese firm of Thonet Brothers. A number of New York cabinetmakers produced neo-Egyptian furniture during the 1870s, but the firm of Pottier and Stymus was most often associated with this style (see also the center table, 68.207a,b). This chair is not labeled, but the name Ingersoll painted on the seat rail likely refers to E. Ingersoll, whose name appeared on the Pottier and Stymus list of employees for 1869. This chair was probably made as part of a set for the Bloomingdale family of New York. It retains its original custom-made tapestry upholstery, which adds further support to the attribution to Pottier and Stymus, who devoted a section of their Lexington Avenue factory to the production of hand-made tapestry upholstery material.